This article appeared in the January 2018 issue of The Watershed Sentinel. 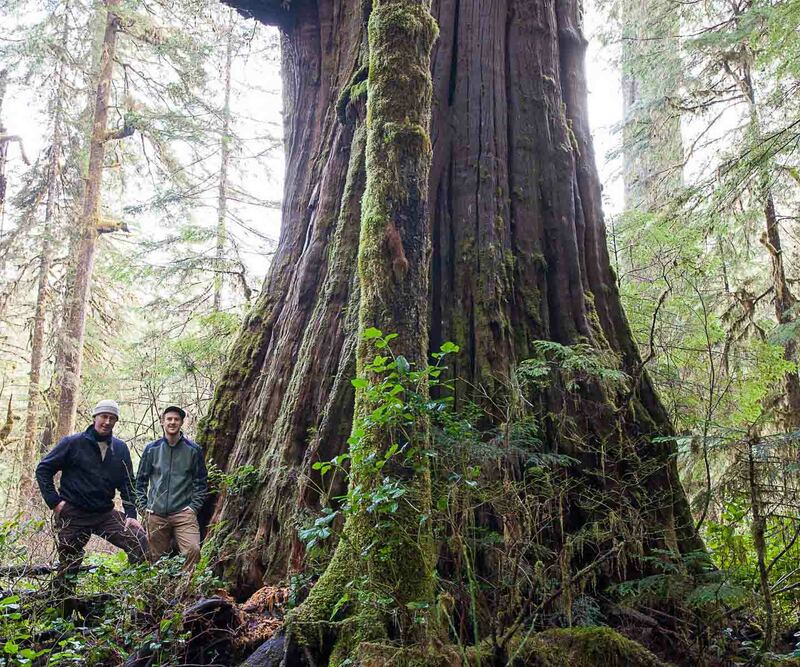 Time is running out for Vancouver Island’s globally rare endangered old-growth rainforest. The new BC government must act quickly for the rainforest, communities and the climate, before it’s too late. Tolkien Giant in the Walbran Valley. Photo by TJ Watt. For millennia most of Vancouver Island was covered by old-growth trees, many more than 1,000 years old. Indigenous peoples lived with and used the rainforest without destroying it. Now, after a century of large scale logging, the majority of these old-growth rainforest ecosystems and more than 90 per cent of the biggest trees have been logged. Instead of phasing out old-growth logging, right now the pace of destruction is speeding up. 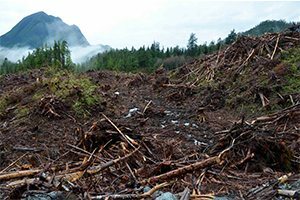 This was revealed recently in a Sierra Club BC review of government data and satellite images of the logging of remaining old-growth rainforest on public and private lands on Vancouver Island. The average annual amount of old-growth logged between 2005–2015 was close to 9,000 hectares (equivalent to about 22 Stanley Parks). However, this annual amount jumped in 2016 to 10,700 hectares (equivalent to more than 26 Stanley Parks). This number is more than 10 per cent higher than the annual average in the 10-year period 2005–2015. The destruction of coastal old-growth is even more concerning in light of the fact that forests in other parts of the province are increasingly hit by wildfires driven by human-caused climate change. In British Columbia alone over one million hectares of forests burned in 2017—the highest number since records started. This resulted in skyrocketing provincial greenhouse gas emissions compared to average years in the past. One of the most important recommendations of climate scientists is that the vast majority of fossil fuel reserves must be left untouched as ‘unburnable’ carbon. This is the only way to stay within our carbon pollution budget needed to limit our planet’s warming. The same must apply to carbon-rich forest and other natural ecosystems. There is now no remaining pathway to saving our climate without swift, strategic action to reduce carbon emissions related to land use. This means that just like we have to set aside large fossil fuel reserves as ‘unburnable’ carbon, we have to map and protect the world’s remaining carbon-rich old-growth forests—such as the globally rare temperate rainforest ecosystems in the Pacific Northwest—as ‘unharvestable’ carbon. Here’s why this is so important: so far, these forests have been relatively resilient to climate impacts like fires and pests. They’ve been a much safer carbon sink compared to other forests. BC’s old-growth coastal rainforests can store 1,000 tonnes of carbon per hectare, one of the highest rates on earth. They’re like a carbon bank, accumulating carbon in soil, trees and organic matter over millennia. Reducing emissions by avoiding logging of this old-growth has immediate benefits for the climate. Shockingly, about half of the carbon stored in these ecosystems gets released in clearcut logging. Carbon is released from large amounts of waste wood left behind and exposed soils. This is often combined with slash burning, an egregious practice that releases millions of tonnes of greenhouse gases annually and must be phased out quickly. It can take centuries until the biomass reaches previous levels. This is time we don’t have. Contrary to industry claims, more and more research shows that old trees store more carbon per year than young trees. 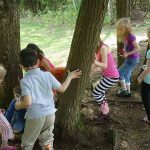 A recent study found that the older a tree is, the better it absorbs carbon from the atmosphere, with almost 70 per cent of the carbon stored in trees accumulated in the last half of their lives. The new findings suggest that old trees store more carbon in proportion to their size. And yet the destruction of Vancouver Island’s original old-growth rainforest is occurring three times faster than primary forest loss in tropical rainforests. According to the FAO, tropical countries lost 10 percent of their primary forests between 1990-2015. On Vancouver Island, old-growth forest declined by 30 per cent over the same time period. Clearcut logging in East Creek, Vancouver Island. Photo by Mark Worthing. Sierra Club BC has estimated the impact of one year’s worth of old-growth logging on our climate. In our 2013 report ‘Carbon at Risk’, we found that one year of old-growth logging on Vancouver Island alone essentially eliminated BC’s progress in reducing carbon emissions that year, releasing approximately 3 million tonnes of carbon dioxide into the atmosphere and nullifying the province’s progress in reducing annual emissions by the same amount. BC’s endangered old-growth forests are one of our best tools for fighting climate change. It makes no sense to cut them if we’re trying to meet our climate goals. We need to save the last of these forests now. The Great Bear Rainforest Agreements show that solutions are possible. The agreements met science-based conservation levels, strengthened First Nations’ rights, enabled conservation financing and forest carbon credit projects, and gave forestry companies certainty for logging under stringent standards. The reduced rate of logging is resulting in 600,000 tonnes of carbon emissions reductions annually, benefitting the region’s First Nations with revenue from carbon. 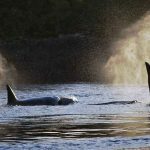 New protected areas and conservation measures for Vancouver Island must respect First Nations’ rights and interests, enable a transition to sustainable second-growth forestry, reduce carbon emissions and support diverse economic activities such as tourism. The Ahousaht Nation in Clayoquot Sound is leading the way in demonstrating alternatives to old-growth logging. Their land use vision includes an end to industrial logging in their territory. Sierra Club BC stands ready to work with the new BC government, First Nations, the forestry sector and other environmental organizations to increase protection of endangered old-growth rainforest as a key part of our response to global warming. This summer’s wildfire’s and hurricanes are a stark reminder that the time to act is now—not tomorrow. Please visit www.rainforestisland.ca and join our call for action. Feature image by Rachel Grigg.